The fastest run from 2016, in .GIF form. The Pikes Peak International Hill Climb makes its return this weekend and if qualifying is a preview of what’s to come, it looks like records will be broken once again. The action kicks off tomorrow morning, so here’s how to watch. 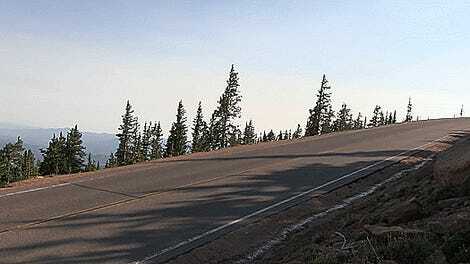 The 12.42-mile long course takes drivers up 8,000 feet to a 14,115-foot summit. If it takes a normal driver an hour to drive up, it takes less than 10 minutes for a time attack car to make its way to the top. Suffice to say, the racing is exciting. Lucky for us fans, there are several ways for us to follow the action. First, there’s the official live stream that promises to be “revolutionary” thanks to specific production techniques adapted for a hill-climb race like this. We assume that means plenty of HD cameras placed along the course and maybe some in-car POV shots along the way. All you need to do is plug in your e-mail address at live.matchsports.com/ppihc.html. Next, if you’re an old-timer who likes to have a radio broadcast running just to have a different commentary to listen to with your live stream, you can hear the action streaming through KRDO NewsRadio. Finally, there’s the official PPIHC app that available for iOS and Android devices where you can follow your favorite drivers and keep up with the leaderboard during the actual race. If you can’t catch any of the action live, lots of the highlight videos will be available on Pikes Peak Hill Climb’s Youtube channel as well. As far as who to look out for this weekend, Time Attack Class 1 is where it’s at. A pair of Hyundai Genesis-es (Geneses, I guess?) with 2016 defending champion Paul Dallenbach and 2012 King of the Hill Rhys Millen facing off should be interesting. Millen’s back in his old time attack car from 2012. Also, our pal Robb Holland will be racing that class in a rebuilt salvage title Corvette Z06, and you should check read about how that car came together here. The exhibition class is particularly light this year, but that doesn’t mean there will be some interesting cars to follow with Faraday Future’s FF91 and Acura’s NSX GT3 cars being the main headliners.